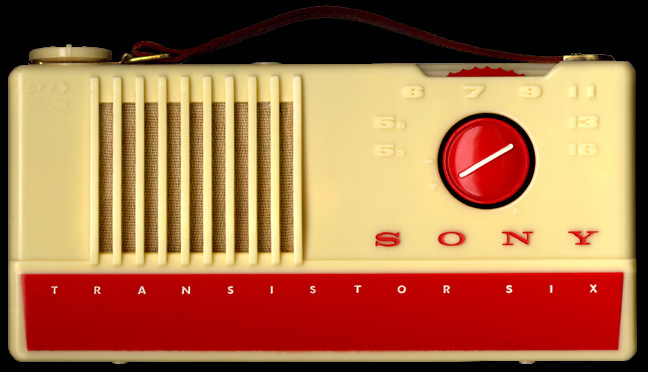 The designers at Totsuko had a clearly defined goal; to create a radio worthy of carrying on the tradition of sophistication and performance established by the TR-6 while at the same time greatly reducing the cost of the product. Quite the trick, actually. To make a jump that reaches both higher and lower than where the bar is already set. So, what do you get when you remove all the expensive trim pieces and expendable parts from the TR-6 while also taking advantage of greatly lowered transistor costs to reduce the retail price almost 30%, from 17,900 to 12,800 yen? * The TR-66. Vivid proof that a project to reduce a product's cost needn't detract from the beauty or impact of the radio. It is also a wonderful example of a company quickly honing its abilities to meet the demands of a new market. Attention to every detail when it came to reducing the number of parts both inside and out shows how clever streamlining and rationalization of production was already an important part of Sony's young history. The result has to be one the most striking and desirable of early Sony radio designs. Where the TR-6 broke new ground in delivering sophisticated modern radio design, the TR-66 seems to offer counterpoint by aiming for a more "retro" look. I find the square speaker grille and cloth speaks back to a previous generation of tube radios, as does the tuning dial knob and the overall linear design of the cabinet. The model's conspicuous absence from all the price guides is most likely due to the fact that samples are so rarely seen that there wasn't any data available. Including all samples in any condition, I've confirmed only a small number of extant units to date. The TR-66 made its market debut on May 1st 1957 in three colour schemes: the cream & red shown on this page, two-tone green, and two-tone blue. * A quick tally reveals that the TR-6 uses twice as many costly cosmetic parts and screws as the TR-66. The total comes to roughly 54 on the TR-6 vs. 27 on the TR-66 when counting the chassis as a single part for convenience. At the same time, the price of the transistors themselves dropped to some 40% the cost of the earlier generation initially used in the TR-6.